For most of us who don’t know when Oktoberfest actually happens (myself included, before I thought about writing this article), it is typically celebrated in Germany in the last two weeks of September and in the early days of October. In Singapore, several places follow this timeline and also stop festivities by early October! But, there are several exceptions to this rule and below, I list 7 delicious options to celebrate Oktoberfest throughout the rest of October. For those of us who missed the memo about Oktoberfest till now, it is not too late! Our list kicks off with Old Boys Gallery located at Kampong Bahru. I recently went to Old Boys Gallery and thoroughly enjoyed all the food I ordered as well as the extremely artistic environment I was surrounded by here. You can check out my full review here. 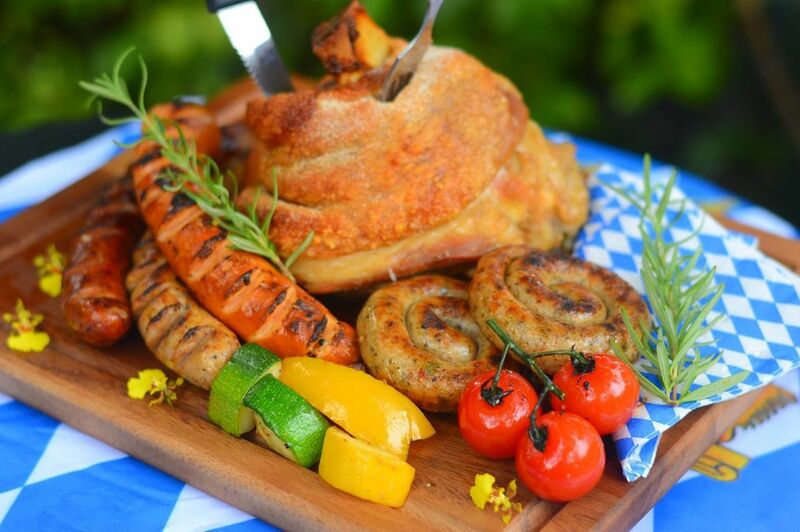 For Oktoberfest, OBG has prepped a special platter called Knuckle Up! Priced at $69 (no service charge or GST – YES! ), you get a 1kg pork knuckle, three types of sausages, Australian ribeye, german potato with crispy bacon, sauerkraut and sautéed vegetables. You’ll also get honey mustard sauce, raita sauce (yoghurt-based sauce) and a rosemary jus to accompany your delectable platter of meats. The platter is definitely suitable for sharing amongst a moderately big group of people. Customers can also get a free pint of beer for every 3 pints when they order the platter this month! This promotion runs from 1st to 31st October. Go to their Facebook page to find out more about them if you’re interested. Red Dot Brewhouse has two outlets in Singapore at Boatway and Dempsey. Both their locations feature different Oktoberfest menus that are running till October 29th! 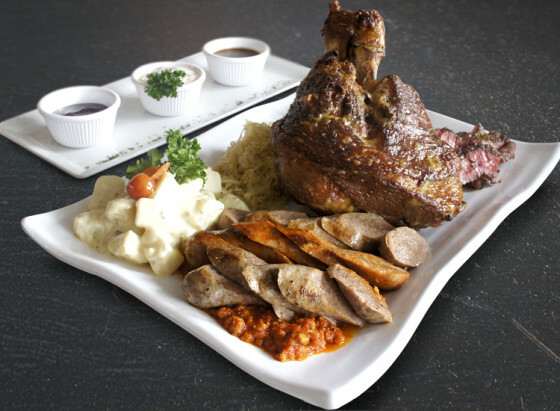 Both outlets feature the Oktoberfest Grilled Platter that comes with pork knuckle, four types of sausages, a chicken schnitzel, potato salad and sauerkraut. The Boatquay menu serves up a variety of other German or German influenced delicacies that include a Beer Stew Beef Brisket ($28) and a Pork Roulade with sauerkraut filling ($25). The Dempsey outlet offers spring chicken brinded in beer and meatloaf, among other options! 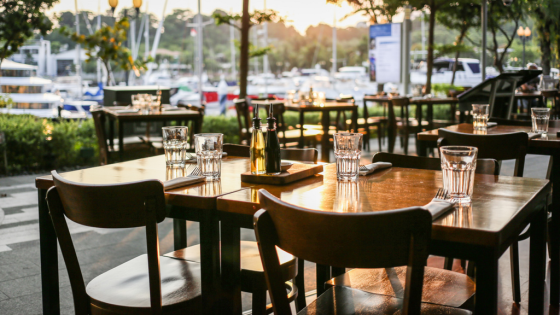 Anyone who heads down to this microbrewery and restaurant will definitely be in for a treat. You can take a look at the detailed version of their menus on their website here! 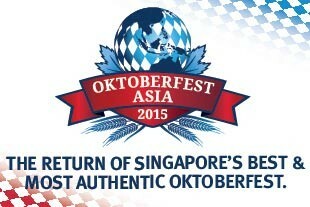 Oktoberfest Asia is back again in 2015 and is happening on 8th, 9th, and 10th October this year! It will be held at Keppel Bay and will feature 8 German beers, a ton of authentic German food, a Munich band and they are plan to offer Jagermeister to those who are dressed in traditional outfits! This seems like a perfect opportunity to have a massive amount of fun with friends or family. Tickets are available here. If celebrating the festivities of Oktoberfest at Keppel Bay is not your thing, Wavehouse Sentosa has also organised a celebratory event this year on 17th October. 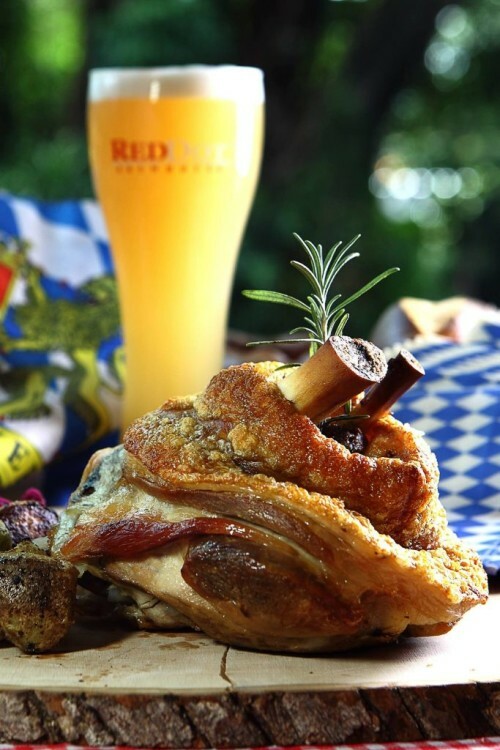 Catch some waves first, then celebrate by feasting on their pork knuckle, weisswurt with sweet mustard, and savour the sounds of authentic Bavarian music while sipping on a German beer. Find out more by checking out their Facebook or their website. Picotin Express has several outlets and is best known for its Italian offerings that are always commendable and full of flavour. This year, they are launching traditional German food listed on its Blackboard special from 1st-11th October. There’s a sausage platter, pork knuckle and mashed potatoes. 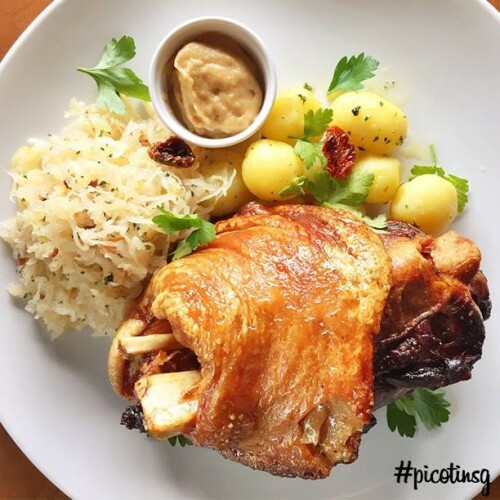 If you’re in the mood for both Italian and German food, or if you and your friends can’t decide between the two for a dinner plan, head down to Picotin Express’ outlet in Sentosa for a nice treat by the water. Here’s their website where you can find their contact number to make a reservation, or just more information about the restaurant. Feast on your food at dusk with Picotin’s Express at Sentosa Cove. Much like many of the other restaurants we have mentioned, Al Forno is offering a special platter for the whole month of October. Their Meat platter is priced at $60++ and is meant for 4 pax to share (as can be seen below). The platter seems to offer a decent variety of options. TIP: this is one of the cheaper platters that appear on this list and so, Al Forno might be the right place to go if you and your friends want to indulge without splurging too much. Having been to Al Forno many times for their authentic Italian food, I can vouch that this platter will offer no less in terms of flavour and quality. Head over to their Facebook for more details. If you’re looking for an extremely refined and composed atmosphere to celebrate Oktoberfest, Carlton City Hotel might be the place for that. 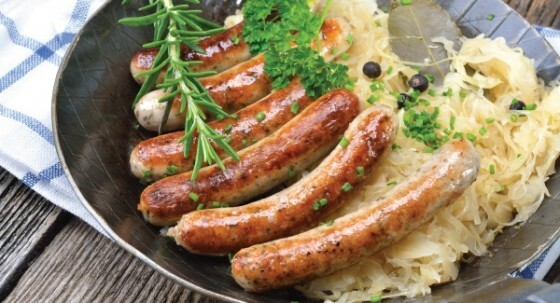 At $39.90, customers get an assortment of German sausages, sauerkraut, potatoes and pickles, with two pints of Tiger or Heineken beer. For the type of atmosphere and the amount of food and drink one gets with one order, this would be a perfect option for those who want to relax comfortably over a beer and some snacks after a long day of work. The promotion only lasts till 10th October so if you’re interested, find some time to head down in the next week or so. More information can be found here. All photos and information was sourced from and can be credited to each venue or restaurants’ Facebook page or official website.